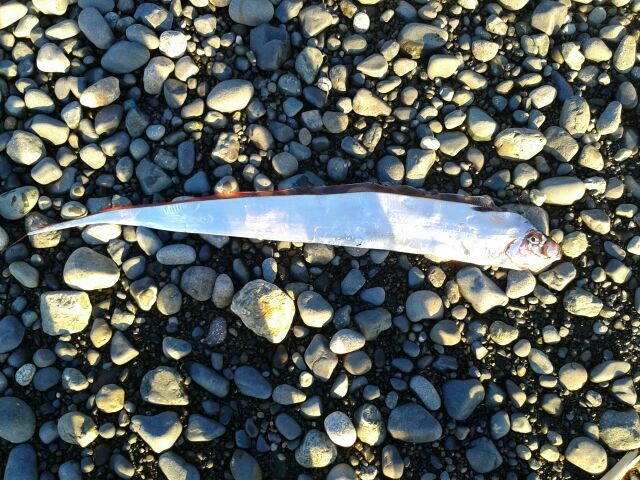 King-of-the-Salmon at ~1.5m long. Photo: September 2017 by Collin Jay Johnson; near Tattoosh off Neah Bay Washington; depth ~100 fathoms. Darren Rowsell with the King-of-the-Salmon found on March 23rd, 2012. Photo Joanne Rowsell. Here’s a finding to enhance your sense of wonder about the sea and how little we know about its inhabitants. 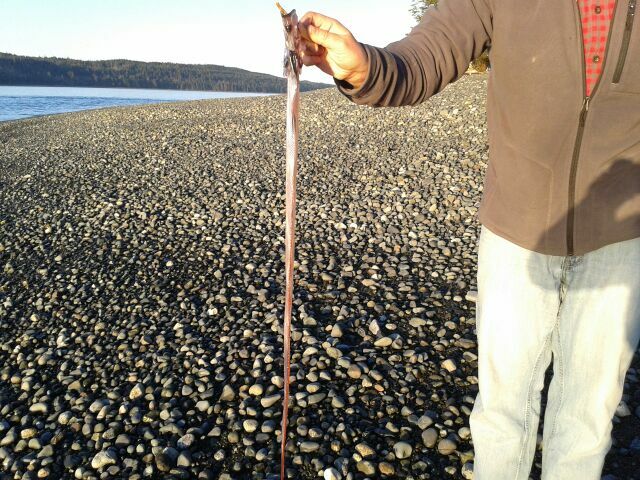 On March 23rd, 2012 Darren and Joanne Rowsell found this dead specimen on the beach at Lady Ellen Point, Port McNeill, British Columbia, Canada. When the photos landed in my inbox, I almost fell off my chair recognizing how rare a find this was. It’s a King-of-the Salmon (Trachipterus altivelis). The adults feed in the open ocean at depths of 900+ m (3,000 feet) so they hardly ever wash ashore and I had never seen one before. Easy to see why the King-of-the-Salmon belongs to the ribbonfish family. Photo Joanne Rowsell. 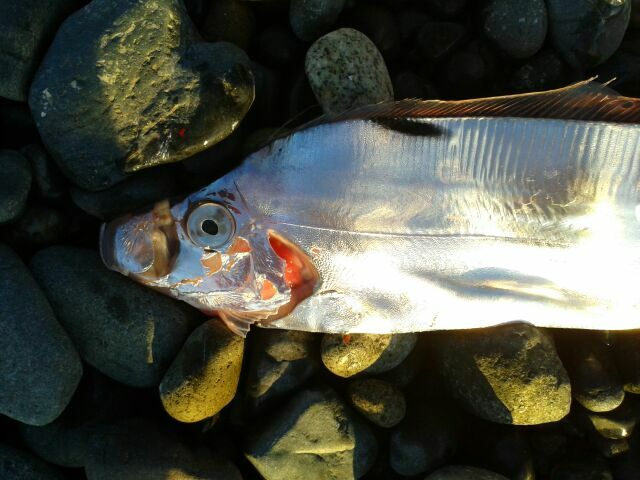 The King-of-the-Salmon belongs to the ribbonfish family (Trachipteridae). You’ll note from Joanne’s photos that the species is indeed very ribbon-like. It is extremely thin and maximum confirmed length is 2.45m (Savinykh and Baitalyuk. 2011). The long, high, crimson coloured dorsal fin is also very reminiscent of a ribbon, tapering down the full length of the fish’s back. These fish move in a snake-like fashion, undulating their long bodies. The unique common name of the King-of-the-Salmon originates from Makah First Nation legend. This fish was believed to be the “king” that would lead salmon back to their rivers to spawn. To kill one was believed to bring bad luck, causing the death of the salmon. The Makah, like other fisherfolk, must occasionally have caught one on their lines or in their nets. 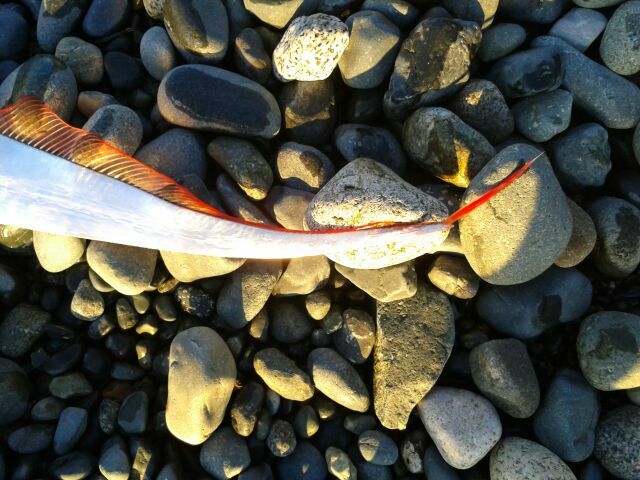 When one of these very rare and unique fish does wash ashore, it usually draws a lot of attention. See the video and photo below for a large King-of-the-Salmon found near Oak Bay, British Columbia on September 21st, 2017. A second one was also found near Oak Bay a few days later on September 26th. A third was found on a beach off Hood Canal, Washington on October 3rd, 2017. And a forth was found in Sidney, British Columbia on October 29th, 2017. (See photos below). King-of-the-Salmon’s dorsal fin extends all the way down its back. Photo Joanne Rowsell. The species range is believed to be from the Gulf of Alaska to Chile. Smaller King-of-the-Salmon do feed closer to shore and their diet is known to include copepods, annelid worms, fish scales, and fish larvae. 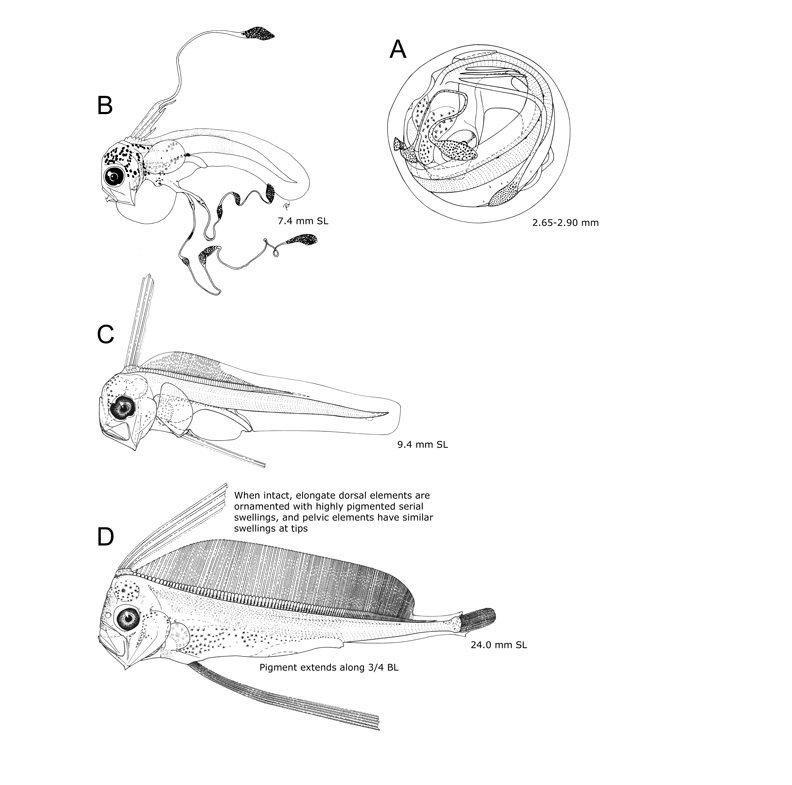 Larger individuals feed on copepods, krill (euphausids), small pelagic fish, young rockfish, squid, and octopus. I presume that stomach content studies have allowed science to determine that the predators of the King-of-the-Salmon include the Bigeye Thresher Shark (Alopias superciloosus), and the Longnose Lancetfish (Alepisaurus ferox). King-of-the-Salmon’s head. Photo Joanne Rowsell. And that appears to be all that is known about the King-of-the-Salmon – yet another one of our remarkable marine neighbours. Love, Dr. Milton. Certainly More Than You Want to Know about the Fishes of the Pacific Coast: A Postmodern Experience. from the northern part of the Pacific Ocean. J. Ichthyol. 51:581–589. King-of-the Salmon found near Oak Bay, British Columbia on September 21, 2017 by Ben Clinton Baker. It will end up on display in the Shaw Centre for the Salish Sea in Sidney, British Columbia. Photo: Oak Bay News. Click here for the story. Below, video of what is presumably this individual when still alive. Credit: Peter Rowand. 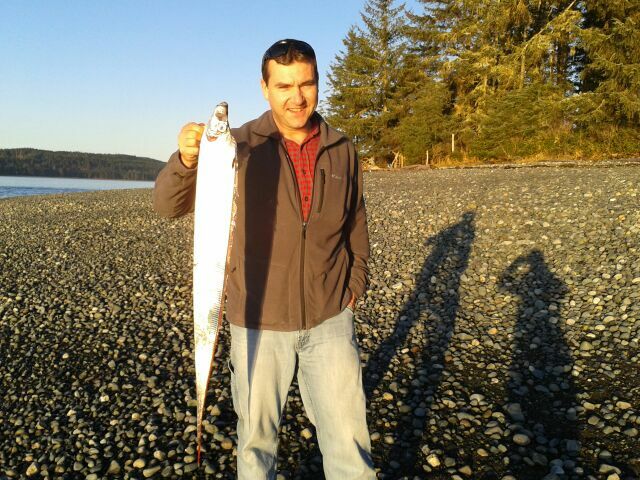 Second King-of-the-Salmon found near Oak Bay. Photo: Emily Walsh, September 26, 2017.
on October 3, 2017 by Chris and Randi Jones. It was 1.8 m long (71′) and 3.3 kg (7.25 lb) and necropsy found that “there was nothing in the gut to indicate it had eaten recently”. and Photo: Lisa Hillier; Washington Department of Fish & Wildlife. A: Matarese, A.C., and E.M. Sandknop. 1984. Identification of fish eggs. In H.G. Moser, W.J. Richards, D.M. Cohen, M.P. Fahay, A.W. Kendall, Jr., and S.L Richardson (eds. ), Ontogeny and systematics of fishes. Spec. Publ. 1, Am. Soc. Ichthyol. Herpetol., p. 27-31. Allen Press, Lawrence, KS, 760 p.
B: Charter, S.R., and H.G. Moser. 1996.Trachipteridae: Ribbonfishes. In H.G. Moser (ed. 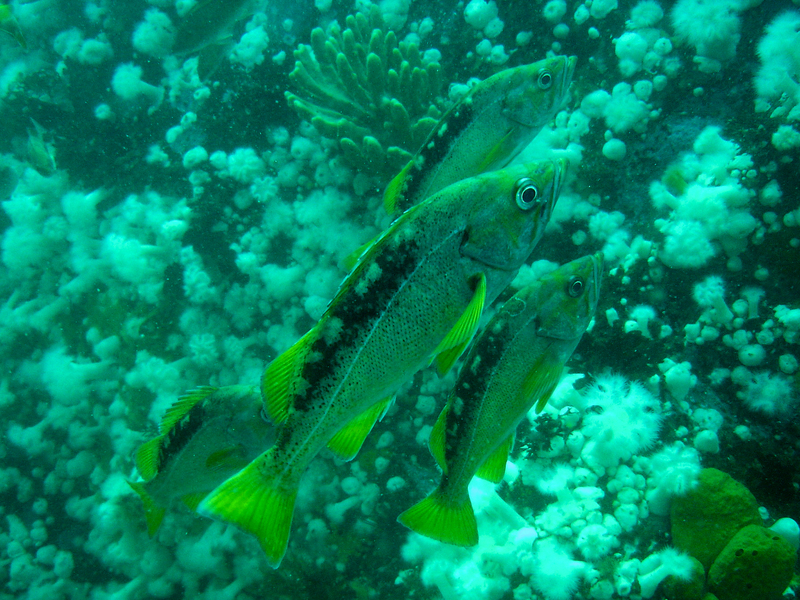 ), The early stages of fishes in the California Current region. CalCOFI Atlas 33, p. 669-677. Allen Press, Lawrence, KS, 1505 p.
C and D: Matarese, A.C., A.W. Kendall, Jr., D.M. Blood, and B.M. Vinter. 1989. Laboratory guide to early life history stages of Northeast Pacific fishes. NOAA Tech. Rep. NMFS 80, 652 p.